Kamshet is an attractive hill station in the Western Ghats of Maharashtra. The hilly retreat is well-known for paragliding and flying schools.Being surrounded by the Western Ghats, this place is a regular in the list of top 10 destinations in India for an adventure junkie. Stunning green cover, placid lakes and undulating hilly terrains make this place a perfect holiday destination. Floating over the Pawna lake and gliding over the beautiful village side, the place does offer you a once in a lifetime experience. Best Time To Visit Kamshet: Kamshet is a year round destination, best months being October to April. By Train: Regular suburban train services run between Pune and Kamshet. If you are starting from Mumbai, you can board a train to Lonavala. From there catch a suburban train to Kamshet. By Road: One of the best ways to reach Kamshet is by road. The town is well-connected by roads and there are regular busesthat operate from major cities to Kamshet. The total driving distance from Mumbai to Kamshet is around 102 km. One can drive through the Bangalore - Mumbai Highway via Navi Mumbai - Rasyani - Lonavala - Karla to reach Kamshet. It would take you approximately around 2 h to reach Kamshet, via the Bangalore - Mumbai Highway. The roads are well-maintained, which helps one to cover the distance at a good pace and the distance is about 102 km through this route. An early morning start from Mumbai is a must for two reasons; one to beat the city traffic and second to beat the highway traffic. Once on the highway, there are plenty of options for one to have a filling breakfast, which begins from the yummy vada pavs, masala pavs, poha, etc., to almost anycuisine throughout the highway. Lonavala can be an ideal stopover for some delicious breakfast.After a filling breakfast, one can go around the place. As it is a popular hill station close to Pune and Mumbai, Lonavala is the place to visit during monsoons. Being a part of the Sahyadri hills, Lonavala offers an alluring and bewitching experience of nature's most gifted region. The Tiger's leap is a very popular spot that attracts a large number of visitors to Lonavala.It is a cliff top with a sheer drop of over 650 m, offering a comprehensive view of the hills and the Western Ghats. The exhilarating views should, however, be enjoyed from a safe spot rather than from the top of the cliff, which is precarious. The echo point on Tiger's Leap is another major fascination. Midway between Lonavala and Khandala is a fort by the name of Rajmachi,a prominent landmark that watches over some of the most breathtakingly beautiful and wide sceneries of the region. The fort complex comprises of two forts, which are individually located at the Shrivardhan and Manaranjan Peaks. From the fort, one can get a bird's eye view of Duke's Nose, Karanala, Mahuli, Bhimashankar, Matheran and the Ulhas River. Kamshet is a beautiful getaway from the city of Mumbai and offers some beautiful scenic views of the Sahyadris. The Kondeshwar temple here attracts a large number of people, who are spiritually inclined while the Bhandar dongar and the Bhairi cave attract the adventure junkies. The Bhandar dongar is also known as Temple hill; one find a shirne dedicated to the Saint Tukaram here. 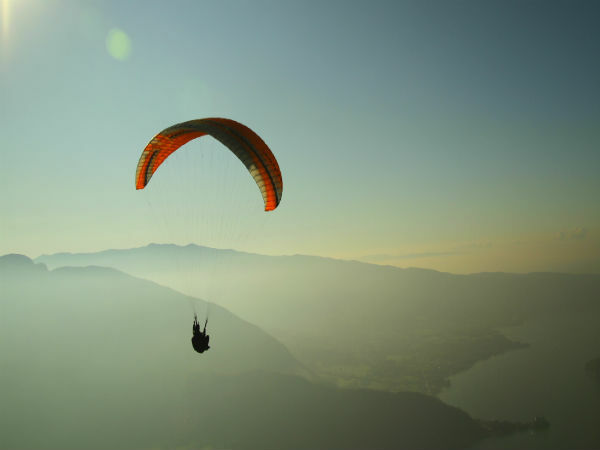 The hill also attracts adventure enthusiasts due to its sloppy terrains, which makes it a perfect place for paragliding. The Bhairi cave is infamous for animal sacrificing that is still practised here. One can find several utensils used for cooking inside the cave. According to local belief if a person tries to steal these utensils they would be punished by the Goddess Bhairi who would throw you down to the adjacent valley.